Hereabouts, a proper pilgrimage will take you north along the west shore of Lake Winnipesaukee to Meredith, NH where you’ll find the local temple of motorcycling, Laconia Harley Davidson. It’s open to the uninitiated public, a venue for neophytes to entertain the high ministers of all things Harley Davisdson. As you might expect, the overpriced trivia are monumentally eclipsed by the 2016 Harley Davidson CVO Road Glide Ultra, listing for $40,299. Okay, it’s the most expensive production bike I could find on their site, a luxury touring cruiser. Most of their big motorcycles are in the 16K-28K range. Still second mortgage territory, though. I’d have to conjure up some special mental magic to make that work. So it’s pretty amazing that 8 out of 10 bikes I encounter on the road seem to be big HD cruisers. The 9th will be a Japanese version of a big HD cruiser or a big Victory or Indian cruiser. The 10th will be something else, ridden by a lost soul or just a normal motorcycle rider, depending on your point of view. If you currently search cycletrader.com nationwide, upwards of 50,000 Harleys will be listed compared to about 7000 BMWs. Well, it’s some indication of the ownership and market in the HD brand. The big Japanese manufacturers are only a bit less popular by this measure, but I don’t see many of them on the road here for some reason. No, Harley Davidson is definitely the one true motorcycle up in Laconia Bike Week country. Probably in the entire USA. That’s right. No wave. Not from a big cruiser to me on my F650. But if there’s a big cruiser in front of me, there would likely be a wave for him/her. I’ll initiate a wave to another dual sport or standard, and I’ll be ready to respond to any sport bike, but I have no desire to disturb the nirvana surrounding an oncoming big cruiser. It’s now dipping into the thirties (Farenheit) here and the bikes have thinned out dramatically. I’m a die-hard cold weather rider, yet to embrace a single watt of electric heat. And I use the F650 for transportation. So I’m out there. After last winter I know what I can handle comfortably and it’s now routine. What’s the temperature and sun like and how long a ride is it? The answers point to a specific configuration of cold weather layers and gear. Routine. In this cold, I’ll rarely encounter another motorcycle, but the other day I met one. A big one. A Harley Davidson cruiser. And what was that extending down towards the road with the traditional two finger salute to the fallen brethren and sisters? A genuine true believer motorcycle wave! Catching me unprepared, my only reply was a feeble nod of the helmet. It could be that at 35 degrees we are all just hard-core disciples of the open road, happy to see someone else under way. Maybe I should try initiating a wave on the next big Harley cruising the cold two-lane. See what happens. Lois Pryce quits her job at the BBC, buys a used Yamaha XT225 and heads for Alaska to start a solo ride to the southern tip of South America via the Pan American “Highway”. 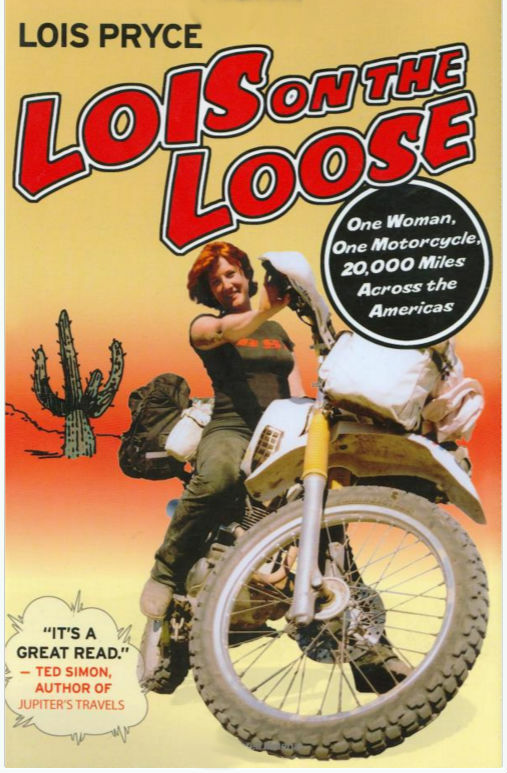 Guys, if you are married and dreaming of getting into motorcycling, ask your wife to get you this book from the library. She’ll love the idea that you are actually reading something and, wonders will never cease, it’s about a woman’s achievement! Only later will she realize she has brought you a book about motorcycles, and is already complicit in your dream. And kinda likes it. Compared to Lois, you are looking like mister reasonable. In some respects the book is the flip side of The Long way ‘Round. Ewan and Charlie back each other up while Lois travels alone. A whole support team including a van and third motorcycle versus nothing for Lois. The guys are each riding a new BMW R1150GS, at the time the gold standard in long distance adventure bikes. Lois has her old XT. Displacement is fundamental in how much power an engine can produce and 1150 is over 5 times the size of 225. The unladen GS is over twice the weight of the XT. It’s the minimalist approach that I find so appealing these days and Lois has nailed it. By the time she has described her first night out camped beside a remote Alaskan highway with snow falling on her lonely tent, I am hooked for the duration. The book has excitement, technical details, humor, danger, tragedy and triumph. It’s wonderful. It may also help you get your own bike. A garage is what you want but your apartment will do in an emergency, especially in winter. The latter if you’re living alone, of course. Well, I suggest the living room because you won’t have thought of it by yourself unless you have those good hillbilly instincts. Under a shade tree, beside the road, on your driveway or a parking lot, in a travel tent, a shed, a rented van or wherever your imagination takes you, you can temporarily create a workspace to do anything from changing your oil to rebuilding your engine. Your “shop” floor should be able to stand some minor fluid spills and be clean and smooth enough to not swallow up any dropped fasteners or small tools. Incidentally, when you lose a fastener inside the motorcycle, always take the time to retrieve it, no matter how long it takes. You don’t want to lose mental control of the bike, with unknown pieces of past sessions floating around, ready to do mischief while you are riding. 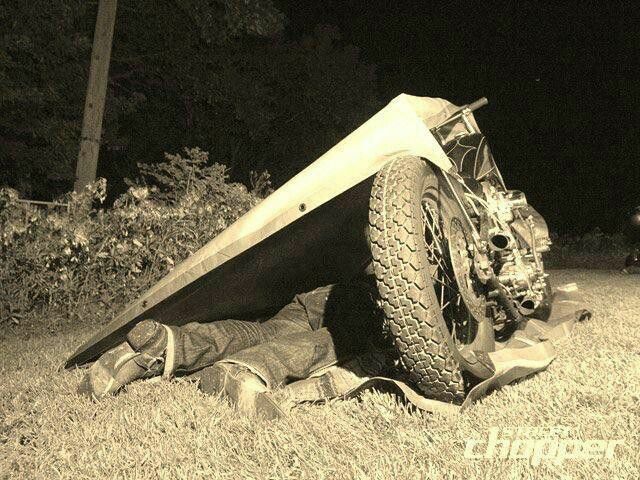 So before you start removing outer panels to look for it, you need to know it is actually in the bike somewhere and not already on the ground. If I am disassembling the bike at all, I like a large plastic tarp spread out nearby. I place a part on the tarp, along with the fasteners for it. When reassembling, the correct fasteners are right there. 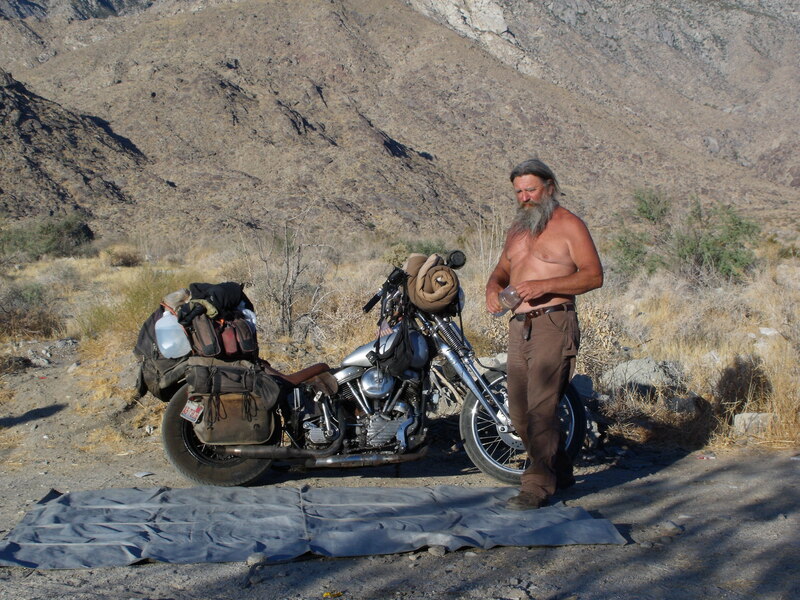 You should carry a tarp on the bike anyway. If your workspace is outside you’ll need access to good weather information. 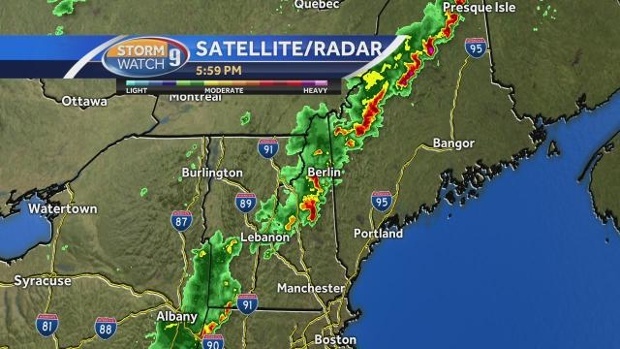 I like the radar app on my iPhone. The screen above shows me getting a dose of red-level rain. Try to complete your tasks in-between storms. 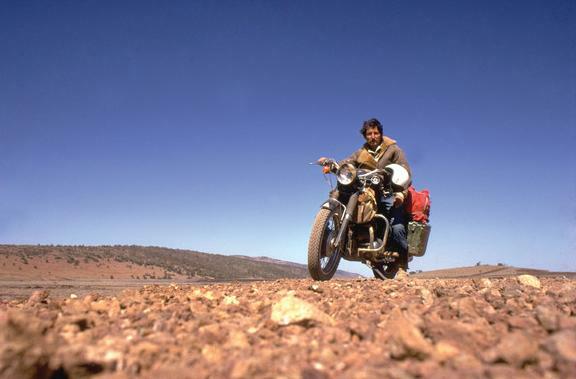 Ted Simon rebuilt the engine in his Triumph Tiger, Jupiter, several times during his four-year odyssey around the world. He did his own work and tended to rent a bay in an existing repair facility with access to tools and relevant supplies. The reflection in the air cleaner cover evokes the scenario of having to work on your bike beside the road. I want to be able to fix a flat tire, sure, but not much more than that with traffic whizzing by. It’s a case for preemptive bike maintenance where ideally parts get replaced before they fail. We don’t have room on our property for a garage, so heaven for me is going to be a heatable shed big enough to do some work in. I don’t count on getting to heaven, though, at least not for the next little while. I would love to buy this 1997 BMW F650. It’s currently on Craigslist New Hampshire, listed for $2250, 15,000 miles, good condition, new tires, battery, chain, sprockets, with minor scratches and a slightly cracked windscreen (near a mounting screw). Unfortunately, I already own one! And I haven’t yet figured out how to make a case that I need two of them. Maybe because I don’t need two of them. I don’t have the space, time, money or rationale for it. I just like the idea of two. Or maybe I just like the fact that for $2250 I can buy a perfectly good motorcycle that is very capable on the roads of New Hampshire. Going further, it is arguably the ideal machine for someone like me, all things considered. First, a dual sport works well for me. The suspension has more travel than a typical street bike, making it better on rough roads. You sit upright, making it easy to take your weight off the seat when a big bump appears. You can ride it standing on very rough going. Like an SUV, it projects a satisfying utilitarian nature. 15,000 miles is not a lot for this engine. In fact the piston has only recently seated itself fully in the cylinder. Collect the last bit of swarf off the magnetic drain plug, put in some synthetic oil if you want and you are good to go to Alaska and back. Or anywhere else. BMW parts are readily available, no matter where you live. I go online at maxbmwmotorcycles.com and pick what I need off the specific parts diagrams for my machine. This bike has a “progressive shock” installed and the owner quotes the seat height at 31 inches, which is an inch lower than mine. 31 would actually fit a 30-inch inseam slightly better than the 32, although I can manage 32 just fine. The F650 weighs about 450 lbs. with fuel. It’s sort of in the lower middle weight range. An XT250 is about 300 and a big Harley maybe 750. Light weight is good when the bike is stopped, maneuvering slowly on rough ground, picking up a dropped bike, transporting it, shipping it, etc. Heavy weight is good in the wind, smoothing out rough pavement, carrying more stuff, and is manageable when the bike is moving. The F650 is more fun off the interstates but it can manage 75 mph if needed. Use earplugs if you want to make a fast run to Memphis for coffee. A 1997 is going to have some old rubber parts on it and these will need to be replaced, especially inside the carburetor, depending on what has already been done to it. 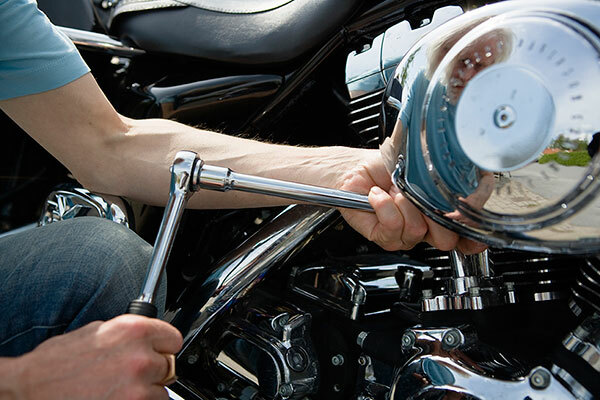 So you need to be able to work on the bike yourself. Having a dealer or other mechanic work on it will be costly. The owner didn’t confirm, but the center stand may have been removed if in fact the rear has been lowered. The stand would have needed to be modified and it may have been easier to discard it. The stand is useful when servicing the chain and working on the tires and on the bike in general. Something to consider. I’d replace the windscreen, possibly with a taller one. My bike came with a top box, and I think it is important to have one. This bike doesn’t. Ideally find one used for $200 or so. If I had it to do all over again and hadn’t bought the bike I presently own, I’d be going to look at this one. It’s about 100 miles away.